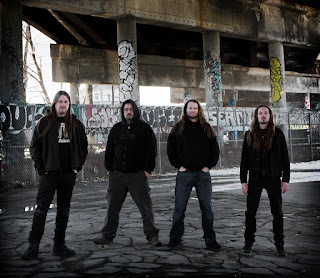 Augury are a progressive death metal act that hail from Montreal, Canada. The Illusive Golden Age is their full length album, and it is one of hell of a treat for fans of technically complex extreme metal. The band's music is intricate, yet crushing, and always perfectly played. The immensely talented band members are rich in playing capabilities. As a whole they, and their music, amounts to a furious and technically savvy slab of brutality. From the very first track, which is also the title track and probably my favorite song on the album, they let you know what you are in for. The intro has a beautiful and almost haunting quality to it, Then drums (by Antoine Baril) kick in, leading to a gorgeous, soaring lead break (the guitars are handled by Mathieu Marcotte, who also does bass duties and vocals). The music then becomes brutally heavy but is offset by an underlying beauty, which plays off the furious blast beats and anger filled vocals. Speaking of brutality, that is the only right way to describe the battering assault of the blast beat filled "Mater Dolorosa". "Maritime", meanwhile, pummels the listener into submission and then unleashes a riffing and complex drumming experience that will beat you even further into the concrete. Only to slow down into beautiful and atmospheric bits of guitars playing that bridge into further savagery. "Message Sonore" is an incredibly intricate instrumental that further drives the point across of how incredibly talented Marcotte and Baril really are. The final track "Anchorite" is slow and filled with atmosphere, crunching riffs, and inhuman growling that will make you feel as if you are flying through space, a very scary and dangerous part of space, that is. 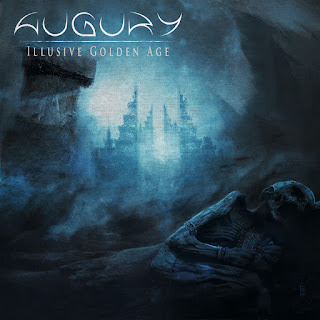 Augury's Illusive Golden Age is a welcome fresh sound in the death metal world. It features undenied talent from its band members, and their sound which perfectly marriages beauty, ferocity, and brutality. Fans of earlier Opeth albums like Ghost Reveries will find much to like here. In other words, this is a must for fans into extreme and complex music.